This album can be summed up in very few words, energetic, chaotic, and abrasive. Every element of the band has been kicked up another few notches in terms of pace and the extreme nature of it, with Cedric maintaining his falsetto for much longer portions of songs, Thomas Pridgen playing the drums like and absolute madman, and even the production and mix accentuating the loud nature of the album even further. Despite the extreme nature of the album as a whole, I do appreciate that after Amputechture, an album filled to the brim with excess in songwriting (which to be fair, I loved), the songwriting and structure for the most part has been cleaned up, with less sections dedicated to atmosphere and jamming, and more time bombarding the listener with noise, along with keeping the songs shorter, with only 3 of the 12 going above 8 minutes, creating an album that feels more concise, despite it being approximately the same length as Amputechture and Frances the Mute. There is a great variety of songs on this album, ranging from somewhat accessible songs, to complex compositions that feel incredibly difficult to wrap your head around. The album starts off with a bang, with the intro to Aberinkula genuinely scaring me the first time hearing it, simply due to how suddenly it began. This song is essentially showing what's to come, being one of the more abrasive songs on the album, thanks to Cedric's vocals in the chorus being absurdly high, before the second half breaks into a dissonant saxophone jam that is reminiscent of Van Der Graaf Generator's White Hammer (albeit nowhere near as harrowing). Metatron continues directly from where Aberinkula left off, but further ups the energy, along with including the first of many choruses on the album that are insanely catchy. This song's structure is really interesting, going off on tangents constantly, making the song very unpredictable, but always going back to the chorus, which is fairly simple and fun, creating a wonderful contrast. After this, there are what are probably the 3 most accessible tracks on the album, Ilyena, Wax Simulacra, and Goliath. Ilyena is undoubtedly the grooviest, most purely enjoyable Mars Volta song ever created, with such a perfect beat to complement the melody, making it almost impossible for me to not grin any time I hear it. Wax Simulacra is another great song, particularly when the vocal layering and harmonisations come in, which creates a really great effect. Goliath is one of my personal favourites on the album, perfectly displaying both aspects of this album perfectly, that of relentless intensity that almost reaches the point of aural exhaustion, and that of some of the most incredibly catchy hooks I've heard. I love how after an extremely groovy first half, with a standard structure, the second half (which somewhat reminds me of King Crimson's 21st Century Schizoid Man in terms of the bassline) goes completely nuts, with Cedric screaming gibberish and wailing while the sounds in the background produce a wall of noise that adds to the overall chaos, climaxing in the last 30 seconds in a way that never fails to blow me away. After this, the second, much more strange, experimental side of the album begins with Tourniquet Man, a pleasant song that devolves into somewhat obnoxious noise, and while it only lasts for a minute, I do feel like this second half of the song is the first misstep on the album, although I do really appreciate the first half, especially since it serves as a short break from all the hyperactivity, and the second half definitely fits in nicely with the album as a whole, so I don't mind it all that much. Cavalettas is the longest song on the album, and definitely one that took a lot of time to grow on me , due to the way it is written being incredibly odd. While I really love the first couple of minutes of this song, along with many of the riffs throughout, I do find the way it constantly fades out to be a strange choice, that I sometimes love, and other times find it to hinder my enjoyment, depending on my mood, although once again, I really do feel like that's part of the charm of the album, having those moments that are almost frustrating to listen to, but it resolving itself nicely, which this song excels at, as it feels almost disjointed from itself at points, yet constantly returns to particular motifs in order to maintain its identity. 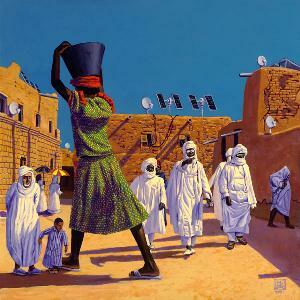 Agadez is by far my favourite song on the album, with 3 distinct sections that get progressively better throughout. The first section is a fairly slow paced song with a fairly powerful chorus, displaying quite a lot of restraint compared to the rest of the album, before exploding into a beat that reminds me of Drunkship of Lanterns, which when combined with the amazing bassline, creates an absolute powerhouse of a song. The final section manages to further improve upon this by becoming much heavier and introducing a killer riff. Askepios is the only time on the album in which I feel like there is a true misstep, as I find this song to be genuinely bad, with fade outs that last too long, no direction to it, and nothing to make it all that interesting. Ouroborous returns to the purely fast paced nature of earlier songs from the album, while also including some of the best drum and vocal work on the album, another definite highlight. Soothsayer is an interesting song, as it is very atmospheric and eerie, with a much slower pace, very little variation, and some exquisite use of vocal distortion, an oddity, but a great song nonetheless. While Conjugal Burns is one of the less memorable tracks on the album, I definitely find the outro to be the absolute perfect way to end the album, with a loud, unpleasant mess of screaming, distortion and white noise all coming together and then just completely cutting out for one last refrain. While reviewing this, I was originally going to rate it three stars, as I felt as if many moments just didn't quite reach the heights of previous albums, and the abrasive nature got in the way of me fully enjoying it, as well as it always being listened to much less than the previous three albums.. Despite this, once I listened through, I felt as if I was missing something, and felt compelled to give it a re-listen, in which case I could pick apart more of the subtle elements to it, such as the bassline in Ouroborous adding a much needed bit of melody to such a chaotic song. I put reviewing this album off for a week or two due to how conflicted my thoughts on it were, but in the end, this has genuinely become my favourite Mars Volta album. It doesn't feel right to give out a 4th 5 star rating to a band, but I genuinely believe that this album is also deserving of it, despite Askepios bringing it down slightly. This is an acquired taste for sure, and a definite grower, for those who hate loud music, don't listen to this, as there will be nothing you will enjoy from it at all, apart from possibly Soothsayer. Despite my seemingly generous scoring, I do understand the significance of a 5 star rating, and simply find this album another Mars Volta album deserving of it, unlike their next 2 albums, which I guarantee will not be even close to 5 stars. Verdict: Recommended to anyone who has enjoyed previous Mars Volta work and can deal with almost unbearable levels of noise at times. Incredible album that takes much of what I love about TMV, and then accentuates them by an obscene amount.